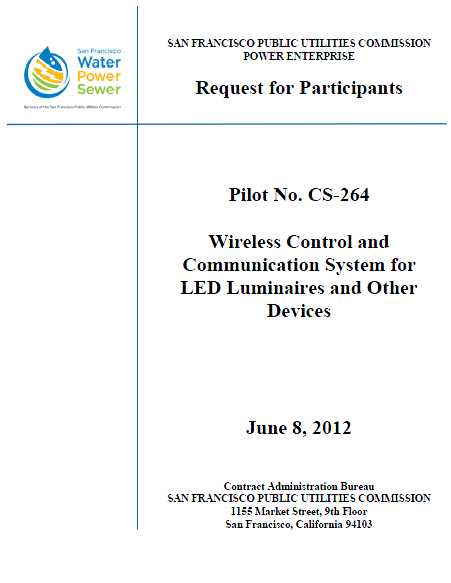 The following request for participants (RFP) was issued by the San Francisco Public Utilities Commission on June 8, 2012. The RFP concerns the construction of a wireless control and communications system for managing the city’s future network of dimmable LED streetlights. The RFP states that future uses for the secure wireless network may include street surveillance, gunshot monitoring, public information broadcasts, electric meter reading and pollution monitoring. For more information on the project, see Rebecca Bowe’s recent article in the San Francisco Bay Guardian. The SFPUC owns and maintains approximately 18,500 cobra-head type high pressure sodium (HPS) luminaires, located throughout the City of San Francisco’s forty-nine square miles. The SFPUC anticipates replacing the existing HPS street light luminaires with dimmable LED luminaires in the next two years. The SFPUC also plans to install an integrated wireless communication monitoring and control system (wireless system) to remotely manage the LED street lights. The SFPUC would prefer to install the wireless system as part of the SFPUC LED Streetlight Conversion Project, but will consider purchasing luminaires and installing the wireless system at a later date. Ideally, the wireless system will accommodate other wireless devices, unrelated to street lighting, in a common wireless system mesh network. The purpose of the RFP and subsequent Pilot Project is to identify innovative possibilities unknown to the SFPUC that may be relevant to City agencies in the future. Respondents are invited to define the characteristics and features of an innovative solution for LED street light control, and include this description in their submittal. The information below is provided to help Respondents identify products that meet the SFPUC’s desired performance criteria for LED street light controls, and to guide the submittal as is relates to wireless control of LED luminaires. It is not intended to limit the scope of the SFPUC’s interest in multifunctional wireless systems. b. SFPUC hosting of wireless network and data. i. GPS mapping function that provides a geographical representation of streetlights’ locations and operational status. 5. Non-dimmable LED street light control systems.